As a complete coffee freak and self confessed addict I am always on the lookout for the best of the best when it comes to my precious coffee. I am constantly reading reviews and forums on what ever coffee gadgets and accessories have caught my attention at that moment. It all started when I needed a new coffee maker so of course I started looking to see which one was the best for the amount of money I was willing to pay. Then it was the search for the best travel mug for keeping coffee hot and the most recent quest has been finding the best coffee thermos. 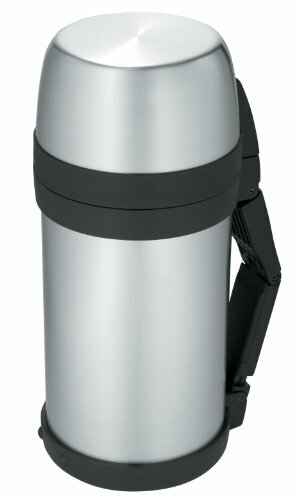 After looking at a dozen or so different thermoses I finally found one that looked like it would be perfect and after reading everything I could find on it I decided to buy the Nissan Thermos 61 Ounce Stainless Steel Bottle with Folding Handle. Now I have owned other thermoses over the years but most were cheap and only did an average job at keeping things hot or cold. So I was very excited about getting to try the Nissan Thermos especially after all the great reviews I had read. Some of the features that made me choose it is the large 61 oz. capacity which is big enough to hold a whole pot of coffee. It is lined inside and out with stainless steel and even has a shoulder strap which I figured would be nice for when I go deer hunting and want to take some coffee for my all day hunts. Another thing that really stood out to me about this model compared to other thermoses I had read about was that it was guaranteed to keep drinks hot or cold for 24 hours. That is a long time by anyone’s standards. Now that I have had it for a while and have been using it daily I am happy to say I absolutely love this thermos. I can fill it up with coffee in the morning before I leave the house and know that I will have HOT coffee all day or until I run out. And when I say hot I mean that on the days i don’t drink all the coffee when I get home in the evening and poor out what is left it is only slightly less hot than when I poured it that morning. A good ten hours later. In fact it is so good that even on days that I don’t leave the house I have been brewing coffee and then pouring it into my thermos so that I can turn the coffee maker off. This does two things it helps keep the coffee from burning and also helps save a little on the electric bill. I know it’s not much but these days every little bit helps. And speaking of money you should be able to find this thermos for under forty bucks which to me is well worth it. So your probably thinking what isn’t this guy telling me well, I’m not going to sit here and tell you this thing is perfect because its not. There are two complaints I have. One is that it must be hand washed which isn’t the end of the world but it is kind of a pain when I could just throw it in the dishwasher. I even ended up buying a nice bottle brush just for cleaning my new thermos. The second thing I don’t like is that the opening or mouth isn’t near big enough. This is horrible either but it does make pouring into a little difficult. Now if you don’t believe me about how good a job the 61 0z. Nissan Thermos does then you really need to read some of the reviews on Amazon. I mean I thought I liked testing stuff out but some of these people really go to extremes to proof how good things are. Like in one review the guy said he filled his new thermos with hot tap water and sat it on his porch in freezing winter temperatures just before going to bed. Just to see if the water would be cold in the morning. To his surprise he stated that it was still as warm as the night before. Or another person that filled theirs with a full pot of tea and left it for a full twenty four hours just to see how hot it would be and whether it would still taste good. In the end I know that all reviews including this one are just a bunch of words from complete strangers. So I will wrap this one up but not before I say one more time that I think this is the best coffee thermos money can buy.